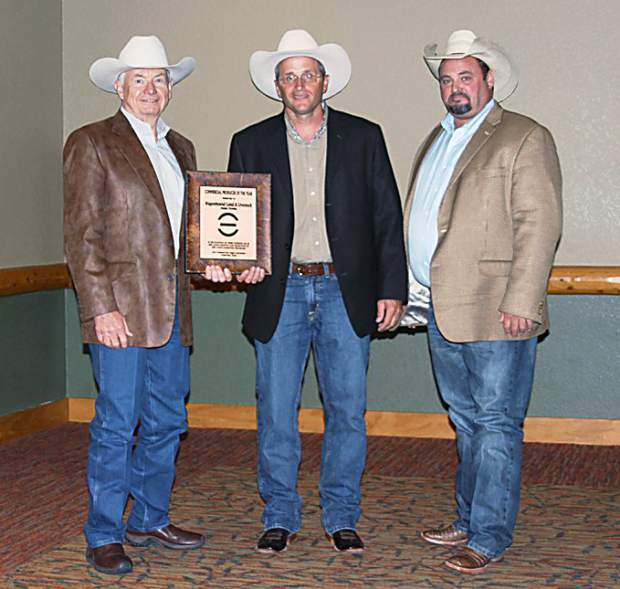 Grapevine, Texas – Recognizing the importance and value of the commercial cattle producer, Wagonhound Land and Livestock, Douglas, Wyoming, was honored as the 2015 Commercial Producer of the Year at the 2015 Red Angus Association of America National Convention. Craig Bieber, Leola, South Dakota, made the presentation. 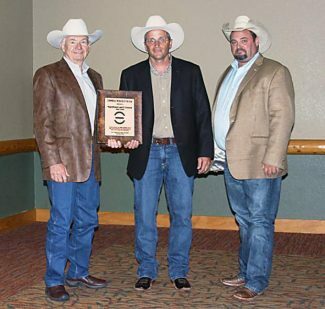 Ranch owner Art Nicholas and ranch manager Dustin Ewing accepted the award. "No operation in the country is stepping up like Wagonhound to buy better bulls and build a better cowherd," Bieber said in making the introduction. "Wagonhound Land & Livestock sells at three different Superior sales. They annually are the highlight of the event. They sell yearling Red Angus cattle, and they epitomize what the top end of commercial producers are doing for our industry." Wagonhound Land and Livestock's roots go back to the 1800s when the cattle drives came up from Texas and pioneers traveled on the Oregon Trail. Located along Wyoming's Laramie Range, the east edge of the Rocky Mountains, the ranch consists of over 200,000 acres with an elevation varying from 5,000 to 9,000 feet. The Wagonhound cattle consist of high-quality commercial Red Angus featuring some of the most popular bloodlines. An impressive remuda of registered Quarter Horses with many cutting championships are also found at the ranch.